A cultural instrument unlike anything you have ever heard! This West-African hourglass drum can mimic its pitch to match the tone of a human voice! These drums are some of the oldest instruments around today, and can be traced all the way back to the Ghana Empire. It is mainly used for a genre of music called griot, developed by the people of Nigeria. The cultural significance of this drum is that it was unique to Africa, and helped them advance in music. Even today, when we think of African music, we think of an almost reggae-ish feel, mainly centered around drums. This used to be used as a form of communication, as messages could be sent through it. Today, we use a phone to communicate, but still appreciate the music coming from the drum.Talking drums are the most exotic and well-known African instrument to have existed! 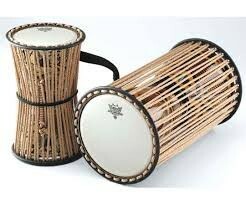 Purchase a drum to open your mind and experience direct African culture! This drum is shaped like an hour glass, and has a hollow center. The hollow center is what allows the pitches to ring through the instrument. The size of the drums vary, and can range anywhere from 5 to 15 inches in length. Variance in size also produces different pitches. African music had many other uses besides communication, as well. Music was frequently used to accompany African dances, usually performed at festivals or ceremonies. Also, storytelling was a key role in music. The sounds and lyrics coming from a song encompassed a message, which was usually based on what instruments were being used. The talking drums were used for communication at first, but then used for other performances for entertainment.